I had promised myself I would post more and more this year and sure would you look, not a dicky bird or not a "yellow bird" as the case may be at all since last year...disgraceful carry on. I have lots of excuses but whats the point in wafflin on about them, it still doesn't change the fact there is no new art here!!! Last year I decided to do a little bit of good for some animals and became a volunteer at the Dogs Trust rehoming centre. They are a great bunch of people, who work very hard to make better lives for all the dogs that walk through their doors and let me tell you it is far more dogs then people would believe. Some of the dogs have been very badly mistreated, abandoned or have lost their owners through old age etc. The Dogs Trust tries to rehome as many dogs as they can possibly squeeze in to good loving new homes. It is a very tough but a rewarding job. I thought I would just mention them and all the good work they do. So if you know anyone looking for a new dog, maybe try the nearest animal shelter/dog pound and give these guys a second chance. Here is just one of the fellas Dogs Trust have up for rehoming at the moment and if I could, I would take him myself in a heartbeat. 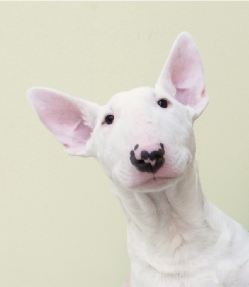 Luah is a 4 month old Bull Terrier and probably one of the cutest Bull Terriers I have ever seen. So there you go, until next time....with some drawings and maybe, just maybe, a sneek peek at a new little project I have up my sleeve. Posted by Gillian Comerford at 2:41 p.m.
Bless you for the good work you are doing with animals. I'm an animal lover so I truly appreciate it. Thanks. 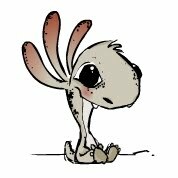 And happy Valentine's Day! Just checking ur blog out and your doing great work with the volunteering. Dying to see some of ur art for 2011!!!! !